MODE Skateboards embraces the diversity of skateboarding with decks and products designed for all types of skating. 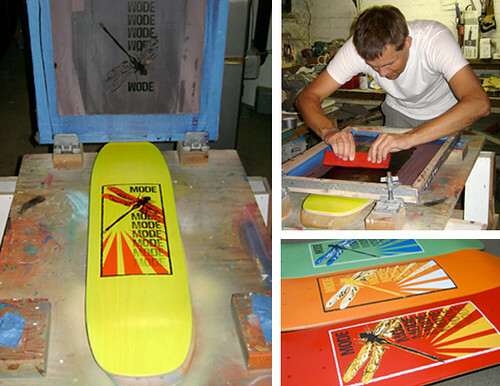 Our boards are made in the U.S.A, and screenprinted by our own hands. With our own in-house screen printing operation, MODE keeps its graphics fresh, unique and always changing. We offer unique base coatings, one-of-a-kind color combinations and limited-edition print runs. That spontaneity keeps things interesting, so check back often to see what we've come up with.